A new suite of aluminum-based alloys developed at ORNL could give automakers the key to achieving ambitious fuel economy goals. The aluminum-copper- manganese-zirconiumalloys—or ACMZ— were developed in just under four years, lightning speed when it comes to developing a complex alloy. Affordable, lightweight and capable of withstanding temperatures 100 degrees Celsius higher than commercially available automotive cast alloys, ACMZ is proving to be suitable for the next generation of internal combustion engines, enabling the industry to advance toward its target of 54.5 miles per gallon by 2025. Current alloys inhibit engine efficiency because they soften at the peak temperatures present in highly efficient advanced engines. Automakers need an alloy that can take the heat, is durable and can be used in existing manufacturing processes. ACMZ meets all these parameters. The journey to ACMZ began in 2012, with a challenge from DOE’s Vehicle Technologies Office for a new high-performing alloy. A multidisciplinary team of materials, metallurgical and computational scientists led by ORNL’s Amit Shyam stepped forward and embarked on the development plan with help from industry partners FCA US and Nemak U.S.A.
Shyam’s team first revisited history, comparing a group of industrially available aluminum alloys, including the RR350 alloy that evolved from a World War II aircraft application. “One thing we do well at ORNL is apply scientific capabilities to solve challenging technological problems,” Shyam said. “We have a unique combination of tools, expertise and capabilities that allow us to do interdisciplinary research beyond what industry can do. Our tools allow us to take a new approach to understanding an existing material. "“We started by looking at RR350. This alloy stood out from the rest because it had remarkable high-temperature properties but had poor casting behavior and wasn’t affordable due to expensive nickel and cobalt additions,” Shyam said. The team put RR350 under the microscope and imaged and chemically analyzed it to the atomic scale, enabling a better grasp of its properties. “We began to understand what happens to the structure and stability of the material as it goes through various temperatures and stresses and, in the process, discovered how to make it stronger and more castable while also eliminating expensive elements,” Shyam explained. Using ORNL’s Titan supercomputer, Shyam’s team performed energy calculations on RR350 that provided key insight regarding its extraordinary stability. With RR350 serving as the baseline, ACMZ was soon born. “The combination of our experimental research, computational calculations and materials characterization capabilities, along with regular participation from our two industry partners, helped us develop ACMZ,” Haynes said. “Early- stage research provided a fundamental breakthrough in metallurgy that was leveraged into the design of this new family of alloys.” Testing continues with FCA and Nemak to evaluate the alloy’s durability in engine applications. 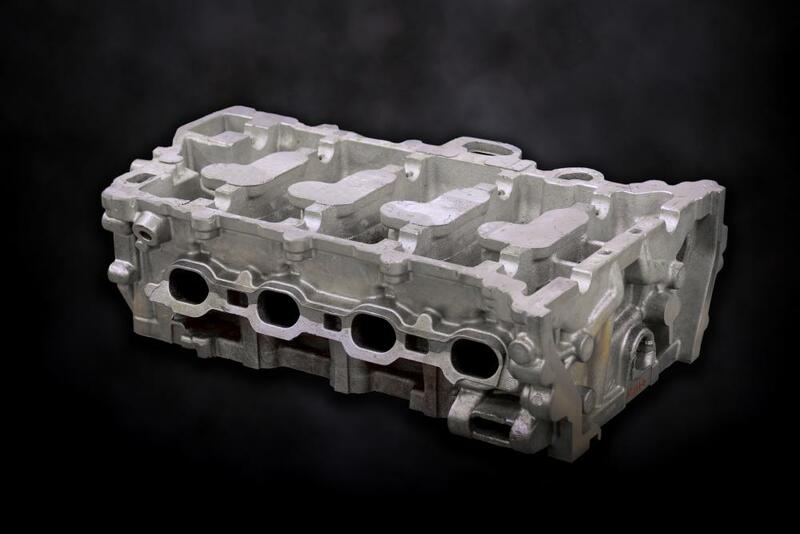 A cylinder head cast from ACMZ successfully completed FCA’s rigorous dynamometer test on a turbocharged engine in December 2017, and internal evaluations of ACMZ will continue throughout 2018.